. . . no small feet: Just say no! It's an epidemic. 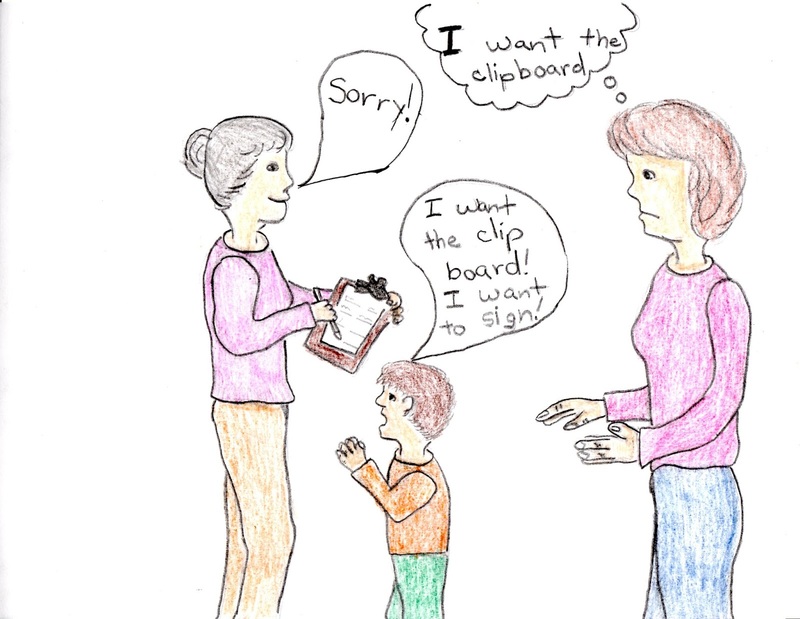 Parents can't say 'no' to their kids - particularly toddlers. The 9 year old baby of our family, Curly, might possess a special power that causes me to cave sooner than I ever did with her siblings when they were her age. I refuse to take credit for being a wimpy parent though .. . . after years of sticking to my guns. I blame my occasional caving on birth order. Or perhaps my advanced age. Or my lack of time. Since I'm driven to distraction chasing in different directions to get kids to their 'stuff' AND cook an awesome dinner, I'm too exhausted to continue to take the old-school-parent high road all of the time. Despite my occasional weakness, I still consider myself lumped in with the near extinct old-school-parent club. Exhibit A: I refuse to ever bend on the cell phone issue. No child of ours will ever possess a cell phone prior to the summer when they start high school. Ages ago, Eddie's best friend's mom assured him he would be texting long before high school. She believed that if Laddie got his phone hours before high school started, then Eddie would naturally receive his when he was in 7th grade. She went on to predict that caboose-Curly would be part of the family cell phone plan by 3rd grade. Wrong. I know I haven't veered too far from my old-school-parent manifesto because my kids are able to recognize new-age parental pitfalls. They raise a wise eyebrow in public at a tot melting down until he gets what he wants. Mini finds it alarming to witness younger cousins whose parents jump thru hoops to keep smiles on their sweet faces rather than deal with discord. A few months ago I told another woman's kid to quit screaming in the grocery store. Since he was about 6, he was clearly too old for a 2 year old fit. Instead of ignoring him, she was offering to buy him something. 'Knock it off!' I hollered. 'Quit screaming!' A grocery store employee thanked me. Theodore, who I sit for, is 3 1/2 years old. He prefers to open the door to our house from the garage each morning. His parents, Gretta and Simon, tend to feed into his demands rather than curb them with the occasional curve ball. Last week, Theo melted down in my garage because his mother beat him to the door. She was carrying his younger brother and the diaper bag. Maybe he was taking his sweet time and she couldn't hold wriggly, 17 mo old Gilbert a moment more? Not one of my kids was still fixated on taking sole responsibility for something by the age of three and a half. They had long since accepted that they couldn't always turn off the TV, flush the toilet, hit the elevator button, or push the automatic door-open switch at the library. It no longer mattered to them, because Coach and I trained them not to care. The next day, Theo opened the door. Himself. Again. After Gretta left, he told me that his mom agreed that if he hustled to the door he could still open it -instead of Gilbert. The perfect re-programming opportunity I had presented her with was foiled. The good n ews is I will only have to deal with her enabling ways so long as I babysit for her kids. She will have to cope with the aftermath for years to come. Theo is currently enrolled in a preschool at Eddie's high school that is offered as part of the child development curriculum. I raced in to pick Theo up on Thursday. A young grandma was ahead of me in line to claim her grandson. 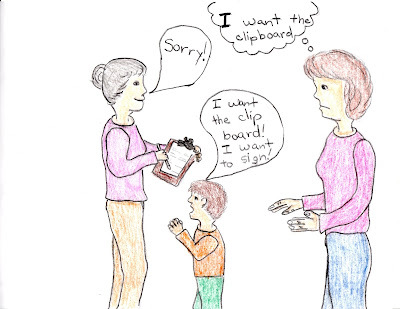 The child pickup procedures include a clipboard signing routine. The grandson was hopping up and down trying to grab the clipboard from grandma. 'Let me write my name!' he was demanding. 'Just a minute,' she assured him. Even though it was clear that I was waiting to sign the clipboard she handed it to her little monster first. 'Sorry,' she apologized to me - which just proved that she recognized that she was being rude.